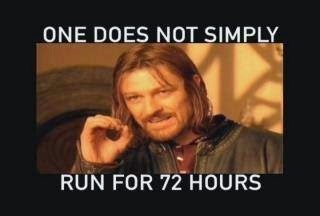 So how does one run for 72 hours? I have no idea. This multi-day event will be a step into uncharted territory for me but I am eager to give it a try. I guess it's taken me long enough. I first remember reading about the history of "pedestrianism:" the fore-runner to ultra-running back in the late 70's soon after I began running. It was fascinating to learn of the 6 day events and some long point to point races between cities and even across the country. But as some of you that follow along with me, I didn't enter my 1st ultra until 2002. And now it has taken this long before I finally make the step into a multi-day event. This will be the 5th year this event has been held at the Sussex County Fairgrounds in NJ.. The course is nearly all asphalt on a 1 mile certified loop with chip timing. It's go as you please and try to cover as many miles in the 72 hours. I can take naps, eat, leave the area or whatever but the clock is ticking. I will be setting up a tent and canopy along the course Hinson Lake style. Pacers are not allowed and I don't have any crew but from what I have heard the care they give the runners is second to none. So what is my plan? As Mike Tyson said, everybody has a plan until they get hit in the mouth. To be honest I really don't have much of a plan and will just take what each day brings me. Ok, maybe a bit of a plan. Keep hydrated, keep the nutrition going, run when I can and walk when I have to. Stay warm, stay dry, stay cool, whatever. Pacing? I have no idea how one spreads their energy over three days so I will just go how I feel. I hope I feel good. Ok, I didn't pay all this money and drive over 500 miles just to lollygag around the loop. You know I am too competitive with myself for that to happen so I am going o go as hard as I can and if all goes well some personal records may fall. I even have one goal that is just too ridiculous for me to even think about but I am anyway. There will be no online tracking but during breaks I hope to post some updates on FB. I will also be texting some of the Angels so maybe they can help with the updates too. Stay tuned. If I survive there will be a report soon !